The Global Settings page can be used to set default behavior that will apply to all forms. Some of these global settings can be overridden in an individual field's options or on the form settings page. Below is a brief description of each option found on the Global Settings page. Use this section to enter your license key and activate all the Pro features of Formidable Forms. You may also use this section to de-authorize a site (remove your credentials from a site). Enter your Formidable Pro license key. This is the key you received when you purchased a license. You can view your license key on the Licenses page. Once your license key is saved, the license key field is replaced with an 'Enter New License' button. This option can be used to change the license key used on your site after you have activated a license. This button allows you to clear your license key from use on the current site. This is helpful for when you are decommissioning a site. On every page of your site - Loads the Formidable stylesheet on every page of your site. With this option selected, the CSS is loaded from the head before any forms or views. Only on applicable pages - Loads the Formidable stylesheet only on pages containing a Formidable form, View, or another Formidable shortcode. The CSS is loaded at the bottom of the page, after your forms and views. This may cause a brief flash of an unstyled form since the styling comes after the form rather than before it. Don't use Formidable Styling on any page - If this option is selected, none of your Formidable forms will receive any Formidable styling, or have access to form layout and grid classes or any other built-in styling. The styling selection on a single form will not override this option. You may choose to use HTML5 in your forms. Some form fields use HTML5 capabilities to enhance the field. Note: Some browsers are not compatible with all HTML5 features. CSS Grids are used for form layouts to allow an efficient way of laying out content and make it more presentable in current browsers. The grid uses a 12-column layout with CSS layout classes readily available in the Layout tab sidebar. If this option is selected, it will load the old styling and support older browsers like Internet Explorer. The date field CSS is sometimes needed on pages that don't contain a date field on them. This option allows you to load the jQuery datepicker CSS on every page. 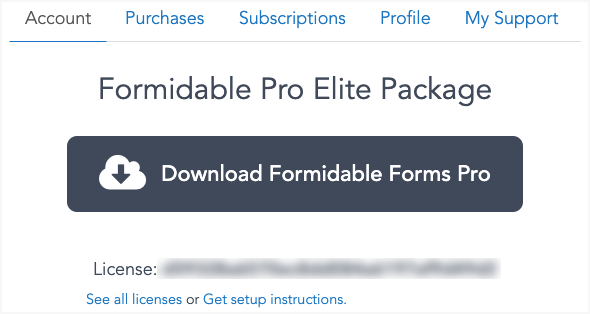 Determine which user types have access to the features of Formidable Pro. These permissions only apply to the back-end features of Formidable Pro. If a user type is restricted from viewing forms, the entire Formidable menu will be hidden for this user type. If you are using a role editor plugin, you can use the Formidable capabilities there. If you would like to use reCaptcha spam protection in your forms, you will need to enter your Site and Secret keys here. For more information on setting up reCaptcha in your forms, click here. You can set the default messages for the validation and success messages. 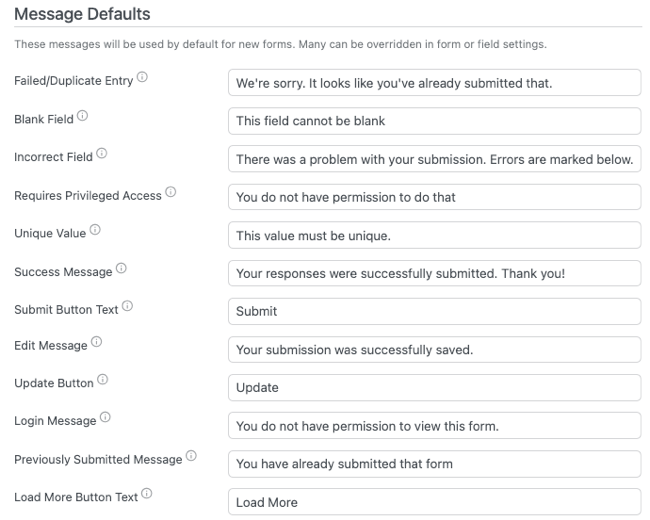 These messages will be used if they are not overwritten in your form settings or field options. Use this setting to control the default date format for all date fields in your forms. Please note that this does not affect the default format when displaying date field values in your Entries tab, emails, or Views. That format is dictated by your WordPress Settings → General → Date Format. This option allows you to change what the 'Forms' menu item is called in your admin section. Replace 'Forms' with whatever you would like the menu item to be named. 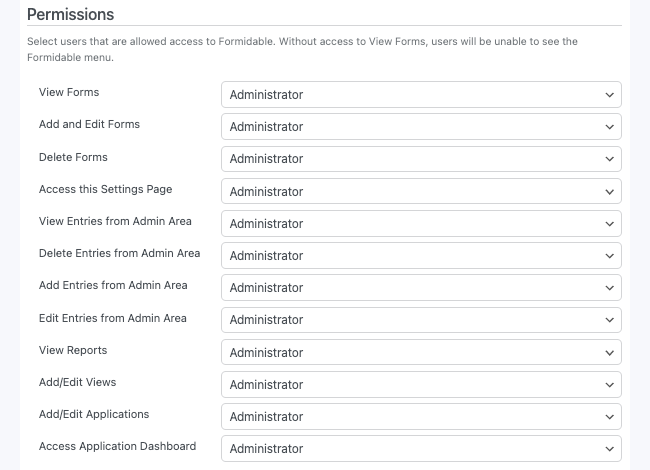 White label your forms by changing both the admin menu label and icon. Selecting the alternative, non-branded icon will replace the Formidable logo in three places: the admin menu, the shortcode builder button in the Classic editor, and the block icons in the WordPress 5.0 editor. If this option is selected, it should not store IPs for any form submissions going forward. Please note that this will affect all forms. Usage tracking for Formidable Forms helps us better understand our users and their website needs by looking at a range of server and website environments. It is completely anonymous and allows us to continuously improve our product as well as our Q&A / testing process. PHP version: so we know which PHP versions to test against (no one likes white screens or log files full of errors). WordPress version: so we know which WordPress versions to support and test against. Formidable Forms version: so we know which versions of Formidable Forms are potentially responsible for issues when we get bug reports, allowing us to identify issues and release solutions much faster. Theme/Plugin names and versions: So we know which themes and plugins to support and test against. While we can’t test with all 50,000+ plugins, we do our best to test against the top plugins from this list. Formidable Forms settings: So we know which settings people are using, allowing us to determine potentially which new settings or areas of Formidable Forms people want us to expand on, and which settings aren't being used. No sensitive settings are collected. If you do not want to share this data with us, you can opt-out at any time with the option on the Global Settings page. If you would like to uninstall Formidable and delete all forms, entries, views, styles, and all other Formidable data, you may go into the Formidable Global Settings and click Uninstall Formidable. Please keep in mind that there is no way to undo this action. This action can be helpful if you have installed Formidable on your site, but the database tables weren't created correctly in the initial installation. This action is not recommended if you have any forms or entries on your site.